Sunday, 21 April, 1996, is a date that will forever be burnt into my memory and the memories of the 150 or so former staff of BBC Arabic Television. It was the day that I killed off, at just over an hour's notice, my baby: a television service launched with high hopes and, given a fair wind, one that could have brought about sweeping changes in the media in the Arab world - not just in the Middle East and North Africa, but also in Europe and the US; indeed any country that had a substantial Arab community. But who could have forecast back then that out of the ashes of BBC Arabic Television would rise Al-Jazeera? And who could have forecast that its astonishing impact would reverberate not just around the Middle East but across the Western world? BBC Arabic Television, launched by the corporation's commercial arm, BBC Worldwide, and funded by the giant Saudi Arabian Mawarid Group, was always going to be a problem child with an uncertain and fraught future. The project to establish a BBC Arabic-language TV channel, beamed across the Middle East, North Africa and ultimately to Europe and the US, was either brave or foolhardy depending on your viewpoint. 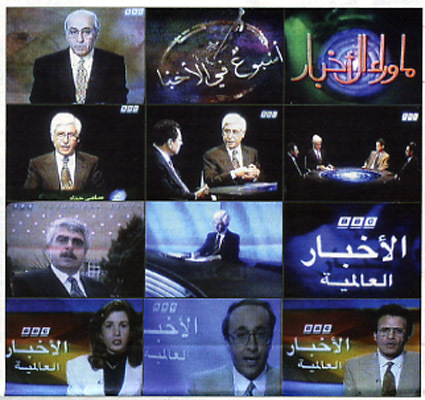 The negotiations for this channel had gone on between the BBC and Mawarid's subsidiary, Orbit Communications Corporation, for several months before finally being signed on 24 March, 1994. BBC World Service Television, as it was then known, desperately needed a big new contract to cover itself financially in the wake of Rupert Murdoch's surprise purchase of Star-TV, from which he had unceremoniously dumped the BBC's signal to the Chinese mainland and Hong Kong. The idea of the Arabic channel was conceived, sold and purchased on the foundations and ethos of the BBC World Service Arabic radio service, which is widely heard and hugely admired in the Middle East. But there were many senior people at Bush House who'd had bruising encounters with the Saudis and they all urged great caution with the project. They were particularly sceptical about assurances that Orbit was prepared to guarantee BBC editorial independence. During the short life of BBC Arabic Television, there were several angry "liaison meetings" with Orbit and the guarantees of editorial independence proved to be a sour joke, only barely obscured by a thin smokescreen about the BBC's alleged failure to observe "cultural sensitivities" - Saudi code for anything not to the royal family's liking. When it became clear to Orbit and Mawarid that it had, in their terms, created a monster not prepared to toe the Saudi line, it was only a matter of time before there would be a final parting of the ways. Having failed to tame the BBC, Orbit was clearly going to make sure no one else had it either. First, its agreement to work with the BBC for an "orderly wind-down" of the service was shown to be worthless when it switched off the BBC channel without warning at the close of the transmissions on the night of Saturday, 20 April, 1996. Then there was a unique aspect of the deal Orbit had negotiated with the BBC. It had won the BBC's agreement to own all the computer, editing and studio equipment to be installed at the BBC for Arabic Television. The reason, we were told, was this was more "tax efficient". Whether this stands up to close scrutiny is now relatively immaterial because it did ultimately help Orbit to obstruct plans to relaunch the channel with new financial backers. The newsroom, the Arabic-language computer terminals, a purpose-built digital studio, the editing rooms and the presentation suites had to be mothballed while Orbit exercised its ownership of the equipment, refusing to allow it to be used by anyone else and failing at the same time to remove it. In the end, the nails in the BBC Arabic Television coffin were driven into it with vigour by the Saudi royal family and its supporters, aided by the BBC's difficulty in finding suitable alternative backers. Within days of Arabic Television being switched off by Orbit, several potential alternative backers had emerged and secret preliminary discussions got under way. There were many clandestine meetings but all came to nothing, for two prime reasons. First, the Saudis let it be known that they would make life difficult for alternative backers, who inevitably needed Saudi goodwill to maintain their other commercial interests in good health. Second, none of the potential backers appeared to have any better concept of BBC editorial freedom than Orbit. Then, of course, there was the hostile attitude of the British Government and British business interests, angered that BBC Arabic Television was rocking the Saudi boat. The failure of BBC Arabic Television is a sad story because of the death of a dream. At the time, the greatest loss was thought to be the fact that tens of millions of Arabs were being deprived of an unbiased, modern television service tailored to their own cultures and in their own language. But it is an ill wind that blows no good. Al-Jazeera Satellite Television went on air at the beginning of November 1996, staffed chiefly by former members of BBC Arabic Television, all of them fervent believers in the BBC ethos of balance and fairness. The BBC lost a channel that was both unique and prestigious, but there are times when I have to confess to myself that maybe the baton that was accidentally handed to Al-Jazeera should now be left with it. While BBC Arabic Television itself may be dead, its editorial spirit, its style and even its programmes, albeit under different names, live on -- transmitted from the tiny Gulf state of Qatar. The terrified and cowed faces of prisoners of war as they are interviewed by a television reporter, the mangled bodies of adults and children killed by missiles while they were shopping in a busy market, the bloodied corpses of British soldiers killed in action. These have become some of the abiding images in a conflict where the level of media coverage has been unprecedented. The contribution of Arabic satellite television news channel Al-Jazeera's to the continuous churn of war images has confirmed what many predicted - that it would be one of the most significant media stories of the war. The decision of the Qatar-based channel, which is part-financed by that country's Government, to broadcast those images has earned it the opprobrium of the West where it has been maligned as little more than a propaganda channel for Saddam Hussein's regime. It is a charge that is strenuously denied by Al-Jazeera, whose journalists have been asked not to talk to the media without consulting the central press office operating out of Doha, such has been the media interest in the channel. "Our critics seem only to look at our coverage with one eye," says recently appointed spokesman Jihad Ballout. "When the Pentagon said that the media should refrain from using the pictures to allow time for the families to be informed, we happily obliged. We carried Donald Rumsfeld's press conference when we were singled out and subsequent criticism of us. And we went further than that and carried an interview with one of the mothers of the US prisoners of war." The main problem Al-Jazeera faces in its coverage of the war is access, adds Ballout. Only one of its journalists was given permission to be "embedded" with the US troops. Two events last week characterise how difficult it is to easily compartmentalise the channel, which was created by BBC-trained staff who had worked on the corporation's Arabic Television channel. In the early hours of Wednesday morning the Basra Sherataon hotel, where Al-Jazeera's crew was based, came under heavy shelling, leading the channel to write to the Pentagon calling on it to ensure its teams' safety. Less than 24 hours later, Al-Jazeera announced it was indefinitely suspending broadcasts from Baghdad after one of its reporters, Tayseer Allouni, was expelled and another banned from working by the Iraqi authorities. This week cameraman Tareq Ayoub died after the company's office in Baghdad was hit by a missile. The station is convinced that this was a US strike and called Ayoub a "martyr of duty". Sami Haddad, Al-Jazeera's former chief editor and now main anchor, says that the channel, which is banned in Jordan and Kuwait, has been accused of being Zionist, as well as being the mouthpiece of Osama bin Laden during the Afghan war. "We set out to reflect the story accurately, but there will always be someone who says you are supporting the views of the opposition." But while debate about the role Al-Jazeera has played in this conflict looks set to continue, it is clear that because it is broadcast to around 50 million people and is received in around 87 per cent of the 100,000 Arab households in the UK, the channel has become increasingly important to the US and British Governments as they battle to win over the Iraqi people. Alastair Campbell, the prime minister's director of communications, in an interview he gave to the Australian Broadcasting Corporation, said the Government had had to adapt its media strategy to deal with the Arabic media. A dedicated Islamic media unit has been set up within the Foreign Office and ministers have been asked to set aside an hour in their diaries "to do Arabic media" because "it is important, it matters that they hear what we are genuinely saying, as opposed to what is being mediated to them", Campbell added. The challenges thrown up by a commercial news channel broadcasting to the Arab world, without the regulatory constraints imposed on Western media, will increase when two new English-language services are launched by Al-Jazeera. One, which will be a simultaneous translation service, is due to launch this year, and a new, entirely English service is under discussion - although it would take a year to set up. Ian Richardson, a former World Service editor who was charged with setting up the BBC Arabic Television channel, believes "things will be changed forever" by the ascendancy of Al-Jazeera and channels such as Abu Dhabi TV. "The networks have been covering war head to head, as it were, and suddenly we have an Arab TV service which is extremely competent. We're now being confronted with things that were never really given genuine thought before." Richard Sambrook, BBC director of news, agrees: "The West is having to adapt to a strong pan-national Arab media. They are not going to go away - indeed, there will be more 'Al-Jazeeras' in future," he says. Although it was not clear that the shelling was directed at the hotel in Basra, where Al-Jazeera was the only TV outfit present, it echoes the strike on the channel's offices in Afghanistan by US forces, which some saw as a deliberate attempt to disable the broadcaster before the fighting moved into Kabul. "Many TV news organisations, even before talk of war in Iraq, have been concerned that the US military, despite firm denials, might at some stage in the war want to shut down uncomfortable media communications from inside the war zone," says Nik Gowing, a BBC World presenter who spent several months investigating the 2001 strike that also damaged the BBC's offices. Gowing does, however, warn against making hasty conclusions about whether the hotel was deliberately targeted. But whatever emerges about the shelling incident, Ballout is in no doubt that the "propaganda war" is being fought as hard as the military campaign. "From the outset, this war has not only been fought on the battleground, but also on the airwaves and in the newspapers," he says. Attacks on the channel because of its decision to show pictures of what were believed to be dead British soldiers are "hypocritical", Richardson believes. "For all these years the global networks have been putting stuff out and not giving a thought to showing some fairly graphic pictures from Jerusalem, the Middle East and certainly when they showed pictures of Iraqi prisoners of war they did not block out their faces," he argues. "For years nobody gave a thought to fact that the images were being seen by people where the event was taking place, and now that the situation is reversed, everyone is saying it's shocking." Haddad insists that the channel is experiencing the same kind of treatment as colleagues working for British and US newspapers and broadcasters when their Governments consider they are not helping their war aims. "I feel sorry for the likes of Andrew Marr and Peter Arnett, who have been criticised, and I hope that people feel sorry for us," says Haddad, who adds that editorial policy still adheres to producer guidelines laid down by the BBC. "We don't show footage just for the hell of it. Any decision we make has to conform to three basic principles: newsworthiness; relevance to the wider context and whether there are verified sources," says Ballout. "If those three things are satisfied then we go ahead." But Al-Jazeera, as Sambrook points out, is "producing TV news for an Arab audience which reflects Arab values, both in content, style and tone". Factors unique to the Arab world also shape the channel's decision-making, explains Ballout, who says that when the channel was created one of the main premises was that it would not "succumb" to censorship. "For decades the censors played havoc and everything was doctored, censored or tamed," he claims. "Our commitment was to give as complete coverage as we possibly could." Ballout rejects claims that showing pictures of prisoners of war contravened the Geneva Convention. "We have it on good authority that the Convention applies to states at war, not to news organisations." He emphasises that the footage was carried with a warning that viewers might find it distressing. But he concedes that "people have said, with good reason, that the Arab world has a higher threshold of tolerance because for five or six decades now they have been living with death, carnage and destruction". Operating in a fiercely competitive market, the channel is setting out to attract more Arab viewers and, unconstrained by the broadcast regulations encountered by the British media, it can adopt an approach that has popular appeal. While channels such as BBC World and CNN tread a difficult line when it comes to covering the Middle East, Al-Jazeera chooses to refer to Palestinians who are killed as "martyrs". And while the roots of Al-Jazeera's journalism are firmly in the BBC World Service, former journalists reserve some criticism for what was perceived as an Anglo-centric operation. "When I joined the corporation in the Seventies we were told we were broadcasting news as seen from London," says one source. "We are trying to cover the news as seen from the battlefield." is to have a professional attitude towards news." Richardson believes that the channel has made some "misjudgements and mistakes", largely as a result of inexperience but "the occasional error of judgement should not obscure the fact that they are doing their best to be a truly independent news service". He adds: "No broadcaster working in a situation like this has got entirely clean hands. If we are going to talk about biased broadcasting then go no further than Fox TV in the US, which makes no attempt to see the war from any other perspective. It's pretty rich that the US can accuse Al-Jazeera of bias and lacking in judgement and taste when there is a channel with reporters saying they will use guns against the likes of Osama bin Laden."